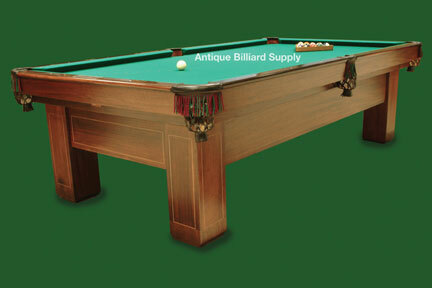 #1-04 Expect excellent performance from this antique Brunswick pool table. Straight-forward design features veneer of ribbon mahogany with lighter accent strips on legs and cabinet sides. Rosewood rail tops with diamond accents. Nine-foot size, three-piece slate playing surface. Available now.